All right, I had planned to take the month of May off, but this is too good not to blog. Amazon has a couple of unbelievable deals on beginner scopes. It looks like both are on closeout, and no telling how long they’ll be around. Both scopes are made by the Chinese company Synta and sold under the Sky-Watcher USA brand. Orion in the US and Sky-Watcher in Europe are both importers that sell mainly (but not exclusively) Synta-sourced scopes. Not long ago Synta acquired prominent US scope company Celestron, which had also been selling Synta-sourced products for years. And now Sky-Watcher has a North American branch called Sky-Watcher USA. Which is all a bit weird, because right now Orion, Celestron, and Sky-Watcher USA are all selling overlapping lines of Synta-produced scopes. I wouldn’t be surprised to see some merging of product lines and maybe even brand names over the next few years. First, because Synta has a pretty solid reputation. Their scopes aren’t premium, but neither are they dogs, and Orion in particular has built a strong reputation for good products and, in particular, good customer service. So I don’t feel bad recommending Synta products that I haven’t personally used. I don’t think these scopes are being closed out because they’re bad scopes. If three companies are selling the same gear, a price war is pretty much inevitable, and that might be a factor here. But it’s can’t be the whole story. 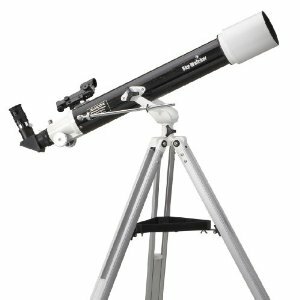 Sky-Watcher USA has been closing out all of its non-electronic intro-level scopes, like this one and several here–all of which are great deals which I would be enthusiastically recommending, if the current Amazon deals weren’t even better. It also matters because the products currently on closeout have been around for a few years under the Orion brand name, so they have a known track record. There might be some differences with included accessories like eyepieces and finderscopes, but in general the reviews of the comparable Orion products are probably applicable. And Orion has been around a lot longer than Sky-Watcher USA, so there are a lot more reviews of the Orion-branded products. Here’s the first: the Great Start 70AR-AZ2, a 70mm (2.75″) refractor on a light altitude-azimuth mount with an aluminum tripod, red dot finder, and two eyepieces. AR stands for “achromatic refractor” and AZ2 indicates the alt-az, or up/down/left/right mount. Orion sells this as the Observer 70 for $140, which is still a pretty good deal. In fact, the oft-cited Sky & Telescope article “Low-Cost Starter Scopes”–which you should see for a serious critical look at this scope, and beginner scopes in general–listed the Observer 70 as a top choice. The Sky-Watcher version comes with two 4-element Plossl eyepieces that are superior to the 3-element eyepieces that come with the Orion scope, so it would be an even better deal at the same price. The current price of $45.01 with free shipping is, frankly, astonishing. I’ve never seen so much scope offered for so little money. You’d be lucky to find a single Plossl eyepiece for that price, so you could think of this as buying a decent eyepiece at a fair price and getting a second eyepiece, finder, telescope, mount, and tripod thrown in for free. Here’s the second: the GreatStart SW 130N-EQ2 , a 130mm (5.1″) reflector on a German Equatorial Mount (GEM) with the same aluminum tripod, red dot finder, and eyepieces, plus a 2x Barlow lens that doubles the magnification of any eyepiece it’s used with. Here N stands for “Newtonian reflector” and EQ-2 indicates the equatorial, or star-tracking, mount. The mount does not come with a motor for hands-free tracking but one can be added (and in case you go that route, here’s the motor you want). Orion sells this scope and mount as the SpaceProbe 130 , for $270. Once more the Sky-Watcher scope comes with better eyepieces, and the Barlow, which is not included in the Orion package. The Orion scope has a 6×30 straight-through finder; whether that is better or worse than the Sky-Watcher’s red-dot finder is in the eye of the beholder (I prefer right-angle finders myself, so this is a toss-up to me). In any case, at $99.99 shipped the Sky-Watcher is another phenomenal deal. Yes, the primary mirror is spherical rather than parabolic, but at a focal ratio of f/6.9 that shouldn’t be a deal-killer (if you’re worried, see this thread for the technical nitty-gritty). And GEMs are slightly more complex than alt-az mounts, which basically have no learning curve, but there are lots of resources online for setting them up (such as here, here, and here) and many observers swear by them. If all else fails, you could probably sell the mount and tripod alone for close to what you paid for the telescope, and buy an alt-az mount. Both scopes are still in stock as of this writing, and still going for the prices stated above, but no telling how long that will last. Should you get one? Only you can answer that, but if I’d been thinking about getting a scope and had been put off by the cost of a good instrument, I’d get one in a heartbeat. To repeat: I have never, never seen deals this good on telescopes, anywhere, ever. Which should you get? 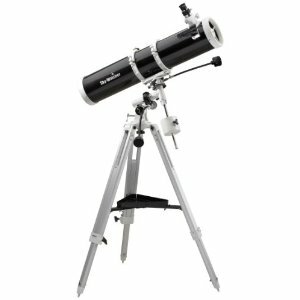 If you’re on a strict budget, intimidated by the idea of using an equatorial mount, or buying for a young person, go for the refractor (70AR-AZ2). It will easily–easily–reveal the rings of Saturn, Jupiter’s cloud belts and moons, zillions of craters on the moon, and plenty of deep space objects like star clusters and the brighter nebulae and galaxies. If you want more aperture and aren’t afraid to spend an evening or two learning how to use the GEM, get the reflector (130N-EQ2). It will gather about four times as much light as the refractor, so everything will be brighter and more detailed and you’ll have the optical horsepower to start chasing faint fuzzies in earnest. Dude, it’s not a fast. It’s a voluntary hiatus, which I voluntarily broke because I think people need to know about these. About 90% of the motivation for running this blog in the first place is to show people that astronomy doesn’t have to be expensive–hence all the links to free stuff. A $45 scope isn’t free, but it’s close enough. These deals might still be here come June, but they might not. So I’m telling people about them. Sue me. Your self-control is weak, old man. My self-control is strong enough to keep me from dignifying this with a respon–aw, crap. I’ll jump in here to defend Matt. I’ll take the blame! BTW, the first two scopes that Matt references early on are both now in my collection. The Sky-Watcher 114N-EQ2 is a smaller diameter version of the 130N, but the same length, and Astronomics has them for $129 – but look around – it wouldn’t surprise me if someone has them for less. The Sky-Watcher 80AR-EQ2 is a bit larger than the 70AR, but is on an EQ2 mount. I think the cheapest price for them is the link Matt gives to OPT, at $99, but I think you’ll have to pay shipping. I am VERY happy with both of these scopes, and I’m quickly learning the ins and outs of the EQ2 – which can be run in alt-az mode if you don’t want to mess with EQ, but it is a heavier mount. Thanks for the heads-up. One is in transit (no pun intended, haha, what are you gonna do about it) to my house as we speak. Cool! Which one did you get? It’s been cloudy here, but during a brief break in the clouds tonight I got the 130N out for a look at the moon and Saturn. The views were good. I’ll blog all about it come June. I’m still in Hawai’i, since the 19th, so I haven’t seen it yet, nor am I at all sure it even arrived, but I ordered the 130. I took my boy up Mauna Kea on the first night of full moon, and he enjoyed the rising moon through a hand-made 120mm Newton, and Saturn through what seemed like it must be a half-meter rig, at the visitors’ center about 9000 ft up. I suppose I’ll have more to say about the scope tomorrow. Those Mauna Kea people have a great deal to learn about harnessing public enthusiasm. I had hoped to try it the same night I got home, but it arrived without a counterweight rod. I’m off to the hardware store to fake one up. On the fifth hunt through the boxes, the rod turned up. Light tonight! Success. Now I have so much to learn. I can tell you the Skywatcher Greatstart 70AR AZ2 was a fantastic bargain! I got mine for $79 and I felt like *that* was a steal. As you mentioned, even if the scope and mount were junk (they’re not) the eyepieces and red-dot finder are worth more than the asking price of the whole outfit. The scope does have some chromatic aberration and when compared to the Orion Spaceprobe 3 AZ, it’s not *quite* as good for astronomical observing. But if if were still around, there’s a lot to recommend it because it can also be used terrestrially much better than Orion’s 3″ reflector.